After some three hundred informal numismatic meetings held in the Coin Room in the South Australian Museum building a group of collectors interested in currency and related subjects decided in 1926 to establish a formal collectors’ group, which they named the ‘Numismatic Society of South Australia’. This Society held its meetings in the Classical Association Room of the University of Adelaide. The Society went into recess from 1931 to 1938, and during the Second World War it held lunch-hour meetings there. In the years leading up to the change to decimal currency in Australia membership grew rapidly—it seemed that everyone was collecting predecimal coins and banknotes before they were withdrawn and replaced by the new decimal currency. In 1966 the Adelaide Coin Club was established to cater for those collectors interested in buying and selling coins and notes, and its main focus was holding coin auctions. The Numismatic Society catered for those collectors who were also interested in the study of currency and related subjects; a handful of collectors belonged to both organisations. In the early 2000s the Adelaide Coin Club closed down due to lack of public interest and declining membership. The Society has published ‘Numis-News’, an early record of meetings, and also ‘The South Australian Numismatic Journal’, whose name was later changed to ‘Australian Numismatic Journal’. To promote interstate friendship the Society held joint numismatic conferences with the Numismatic Association of Victoria for a number of years. 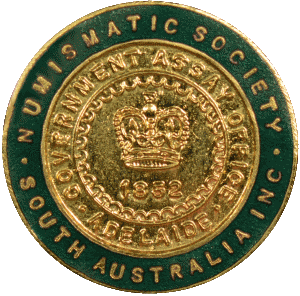 In 1985 the Society became a sponsoring society of the Numismatic Association of Australia (NAA), which holds biennial numismatic conferences involving speakers from Australia and overseas. In October 2015 the Numismatic Society of South Australia sponsored the NAA conference (NAAC2015) here in Adelaide. The Society has issued a number of commemorative medals (struck by the Pobjoy Mint in England and locally by Allan J. Olson). An enamelled membership badge, still available from the Society, was manufactured in earlier days by S. Schlank of Adelaide. The Society has maintained strong links with the Art Gallery of South Australia through the Gallery’s coin, medal and banknote collection. Highlights of this significant collection have been made available for viewing on several occasions exclusively to members of the Society. The Gallery has published a book on the history of its ‘coin room’. This was written by member Peter Lane and is titled “The Coin Cabinet”. 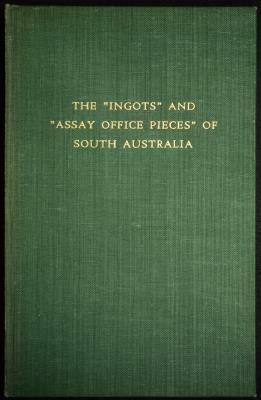 Some notable names include James Hunt Deacon, ‘numismatologist’ of the Art Gallery and author of ‘The Ingots and Assay Office Pieces of South Australia’, John Gartner, founder of the ‘Australian Coin Review’, Syd Hagley, whose famous collection had a proof 1930 Australian penny and Ron Grieg, co-author of ‘Communion Tokens’, which deals mainly with Australian and New Zealand pieces.